Today the enemy of every wiring closet and data center is HEAT. Excessive heat in these areas will shorten the life of your investment in valuable servers and switch equipment. Don’t let your wiring closets and data center become a tangled mess of unmanaged wires that generate heat. Whether it is in your server cabinets, relay rack or under the raised floor, mismanaged cables can choke off the cool air supply and rob your network hardware of performance and life. 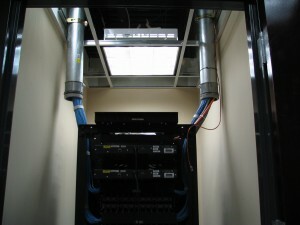 Let Smart Space Solutions evaluate your current cable management and identify any problem areas. Smart Space Solutions, Inc. (SSS) offers a complete array of cabling and network solutions to manage the data/voice/video needs of your organization. Our technical staff can design and install the most cost effective solution for your next telecom installation. From small simple LANs to large complex LANs, SSS can design and install your network infrastructure. A cable management system for ceilings and raised access floors is designed to elevate from ceiling tiles or floor slab, horizontally distribute, and manage low voltage cables. Cable tray systems, whether located above ceilings or below raised floors provide for easy access to all cables. Installation of this system is relatively quick and easy. Smart Space Solutions, Inc. (SSS) is dedicated to providing effective, efficient, and innovative cable management solutions.